In addition to a range of smart features, from remote control to maintenance reminders, the new model offers generous capacity and a host of food preservation features to keep ingredients at their freshest. “The refrigerator’s connectivity, enabling remote management of its features, helps enhance the refrigerator’s efficiency,” said Jenn-Air marketing director Brian Maynard. Similar to the brand’s connected wall ovens, the refrigerator features wireless connectivity and an application for controlling many of the refrigerator’s functions using IOS and Android devices. Using the Jenn-Air refrigerator app enables remote temperature control in the refrigerator, freezer and temperature controlled pantry. For example, when returning home to unload a large batch of groceries, the Max Cool setting, which lowers the temperature for a select period of time, can be activated prior to arriving so that conditions for the refrigerator’s contents are optimized when loading. When extra ice is needed for entertaining, a feature called Max Ice can be remotely activated to increase ice production. Users can choose from a range of notification options, such as a door ajar alert that indicates when one of the doors of the refrigerator has been left open. An over temperature notification sends an alert when the temperature in the refrigerator or freezer compartment reaches above a set temperature. Additional connectivity advantages include a water filter status indicator that alerts users when replacement is needed to ensure ongoing availability of fresh, filtered water. The app also connects directly to the site where replacement filters can be ordered for direct delivery. Other modes and features that can be controlled remotely include Sabbath and Pure Freeze modes, along with Dispenser Light Brightness and Favorite Fill controls. For optimal storage conditions, the brand’s TwinFresh Climate Control System features separate evaporators in the refrigerator and freezer compartments that deliver independent humidity and temperature control, allowing two distinct environments for fresh and frozen foods. An electronic temperature controlled dedicated storage drawer has four specialized settings to provide precise, independent temperature control for sensitive foods. To help keep produce fresh, Humidiseal Crisper Drawers maintain a higher humidity level than the main refrigerator compartment. An Herb Tender Container optimizes herb freshness with a unique, slotted top that allows the stems but not the herbs to be submerged in water. 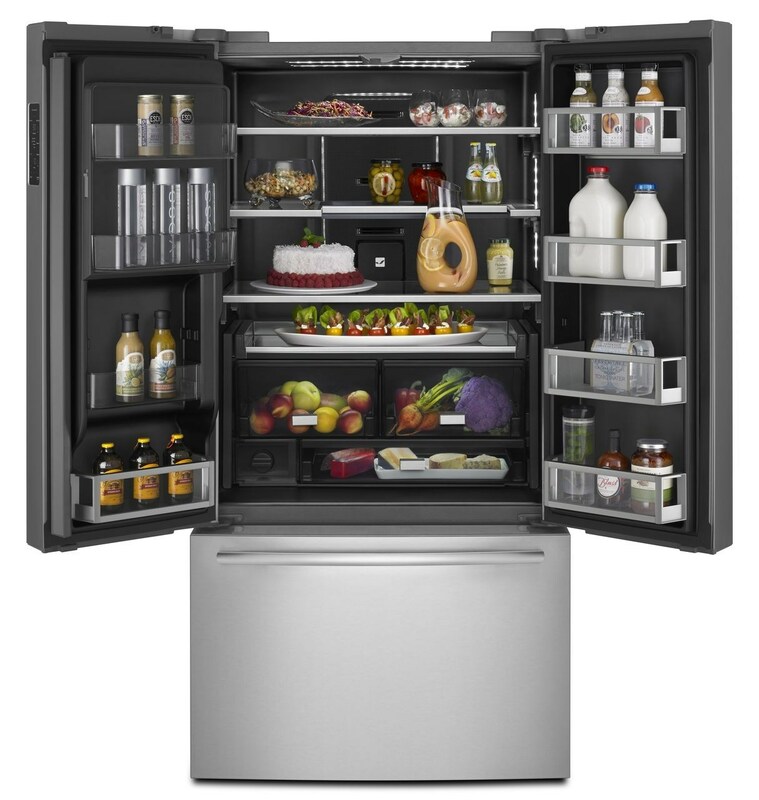 The refrigerator’s interior features adjustable door bins with metal accents that can be positioned to accommodate a variety of container heights. When room is needed for taller items the front half of the fold-away glass shelf can be positioned under the back half. Convenient when entertaining, a Pull-Out Platter, located between the lowest shelf and the crisper drawers, offers a full-width, roll-out shelf for large platters. Additional features on the refrigerator include an integrated cubed and crushed ice and water dispenser with a single paddle design and a pull-out shelf to accommodate large containers like measuring cups and water pitchers. For favorite items that are frequently filled, such as a coffee pot or a water bottle, the Favorite Fill feature allows for two custom presets that can be programmed to deliver precise amounts of water. In the freezer, a glide-out freezer drawer with a premium glide system for effortless opening and closing, offers multiple layers of storage with bins and trays for easy organizing and viewing. Other luxury details found on this model include soft-close refrigerator and freezer drawers. Integrated cabinet LED strip lighting brightly illuminates the interior while drawer lights make sure nothing gets overlooked. Suggested retail prices will be $4,599 for the Euro-Style and $4,699 for the Pro-Style option.